1 of 3 Heat oven to 350 degrees F. In large bowl, beat butter, sugar, egg and salt until fluffy, 3 minutes. On low speed, beat in flour until smooth; stir in pecans and rum extract. 2 of 3 Put dough into a cookie press fitted with a 1-inch sawtooth ribbon disc. Press out long strips on baking sheets. With floured knife, score strips crosswise every 1 1/2 inches. 3 of 3 Bake at 350 degrees F until edges are light brown, 8 to 10 minutes. Cut cookies along score lines; let cool on rack. 1 of 1 In small glass bowl, microwave chocolate at 100% power 1 to 1 1/2 minutes; stir until smooth. Stir in extract and cream. Dip end of each cookie in chocolate; place on wax-paper-lined baking sheet. 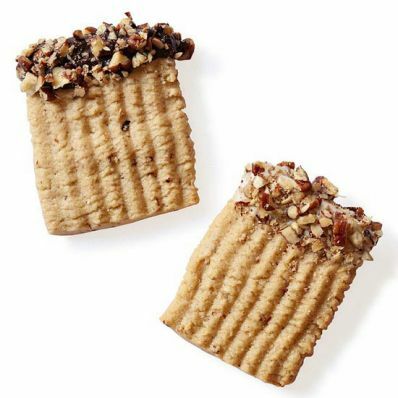 Sprinkle with pecans. Let stand at room temp or refrigerate to set.